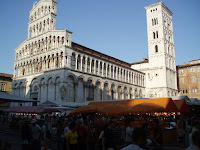 Lucca: Walls, Frati, and a Carnival to Boot! This past weekend four Umbra students made for the ancient Etruscan town of Lucca, famous for its magnificent -and completely intact- medieval wall. But Christy Capriccio, Colleen Puma, Ma ura McGrath and Liza Serratore found that there was more to Lucca than first meets the eye… While taking a stroll around the city, our travelers had the fortune to sample one of Lucca’s lesser known, yet certainly tasty, treasures: a pastry known affectionately by the Lucchesi as “Frati”, made with water, sugar, yeast, salt and lemon. Having enjoyed the doughnut’s distant Italian cousin, the girls chanced upon a charming and brightly lit carnival, complete with rides, cotton candy, and even a Ferris wheel….